Suman Pandey was attacked and footage was deleted from his phone, when he recorded a scuffle which had ensued between BJP workers during a review meeting of the party in Raipur. In what comes as an attack on the freedom of press, a journalist in the state capital of Chhattisgarh was brutally attacked by the workers and the members of the Bharatiya Janata Party (BJP) for filming a scuffle between them on Saturday afternoon. According to the information gleaned from the journalists who were present at the spot, journalist Suman Pandey who works with the digital news portal, The Voices was thrashed by the workers and office bearers of the Chhattisgarh BJP while he was covering the review meeting organised by the BJP to know the causes of their loss in the state assembly elections held in December. 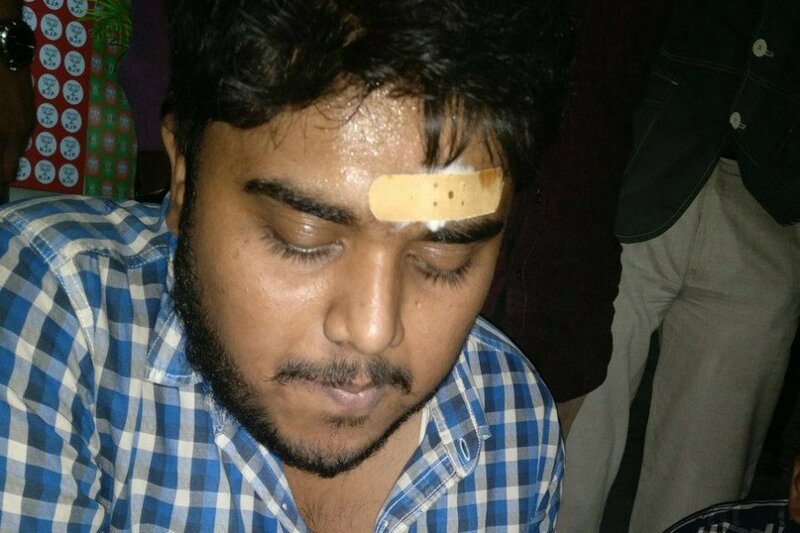 Suman Pandey in his police complaint said that he was attacked by the BJP Raipur president Rajiv Agarwal, Vijay Vyas and Dina Dongre when he recorded the scuffle that had ensued between party workers at the event venue. “My mobile was snatched and they deleted all the footage of scuffle between the party workers. They even thrashed me up brutally,” Pandey said talking to media after getting the FIR registered. “I was even held hostage for more than 15 minutes in the BJP state office by the workers of the party. They first came to me and asked me who I am and when I told them that I am a pressman then they said that I am a Congress worker and started beating me. I have got injuries on my forehead,” Pandey told media. One Vinod Dongre, a journalist from the same organisation, was also injured in the attack. Shailendra Nitin Trivedi, Chhattisgarh Congress’s general secretary condemned the incident in the harshest words and said that it is an attack on the freedom of the press. “This incident has exposed the real face of the Bharatiya Janata Party,” he told over phone. Meanwhile, a large number of journalists from print, electronic and digital media have been protesting against the BJP with the demand to suspend the accused leaders from the party. The journalists sitting on protest have also accused that few members of the BJP youth wing arrived on the protest spot with rods and other things to break the protest before the police intervened. Watching the protest gaining heat senior BJP leader Brijmohan Agarwal and leader of the opposition, Dharamlal Kaushik arrived at the spot to assure the journalists that the party will take appropriate actions against the accused. It may also be mentioned that a journalist was called “Congressi” by BJP in-charge Anil Jain a few days ago in Raipur when he asked a question on the accountability of loss in the state assembly elections. Latest information pouring from Raipur said that the BJP has made all the accused surrender before the police. Confirmation from the police is awaited.